Principal Cast : Russell Crowe, Cate Blanchett, William Hurt, Mark Strong, Mark Addy, Oscar Isaac, Max Von Sydow, Matthew Macfadyen, Kevin Durand, Eileen Atkins. Synopsis: The story of Robin Longstride, an archer from King Richard’s Crusades, who returns to England and takes up residence in a Nottingham manor under the guise of a woman’s deceased husband. King Richard, who died while returning to England, has been replaced by his brother John, a cruel and money-hungry young man who must thwart both impending war with France, but also internal civil strife with the local Barons, who are upset over Johns cruel taxation laws. What we think : Rousing, wide-screen spectacle about the birth of Robin Hood (figuratively) in the way only Ridley Scott can. 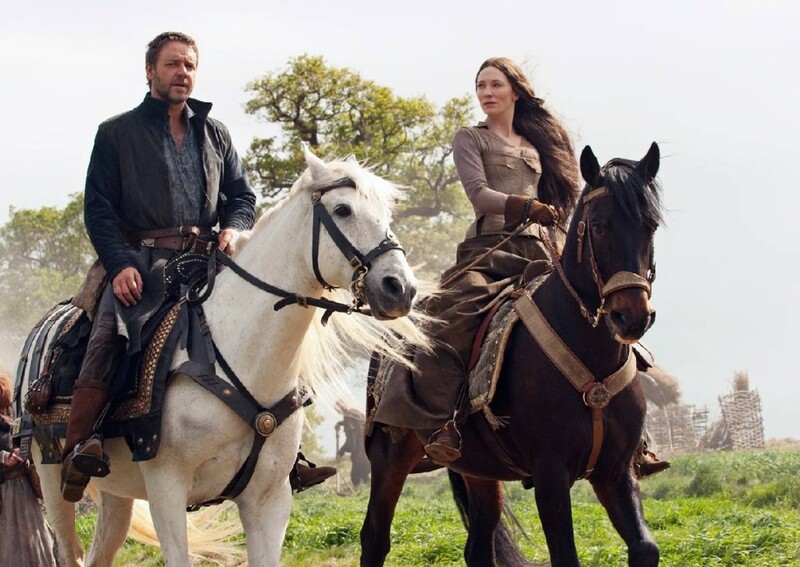 Better than many serious critics give it credit for, Crowe and Blanchett lack the chemistry needed by Robin and Marion, but the film delivers enough action, humour and zest to more than account for this single deficiency. While not a contender for the title of best Robin Hood story by a long shot, Ridley Scott delivers a solid, entertaining and often exciting adventure film in the mould of the grand traditions of Hollywood. Alongside Sherlock Holmes, the legend of Robin Hood is among the most popular story Hollywood likes to trot out from time to time; invariably with mixed results. Errol Flynn undoubtedly remains the chief of all Hoods, whilst US productions such as Prince Of Thieves (with big Kev Costner drawling his way through Middle England) remain inexplicably popular, if contextually inaccurate. The Robin Hood story has, to my mind, been pretty much hammered into the ground, set fire to, buried in a box, exhumed and hammered again. It seems like every other year, as regular as the Olympics, Robin Hood is reborn “for a new audience”, as if the story we’ve heard a hundred times need to be heard again. Yawn. So when Ridley Scott, the man who gave us Alien, Blade Runner, GI Jane and Gladiator, told the world he’d be taking on the job of revisiting the story of the arrow slinger in tights, people became mildly interested. But only mildly. And even then, that interest waned when it was learned that the focus of the story would actually be on perennial villain the Sheriff Of Nottingham, who was to be the Good Guy, while Robin was to be the Bad Guy. You could hear people groan when they heard that. After giving up whatever hallucinogen he’d been using in the meantime, Ridley eventually relented and decided to maintain the status quo that people expected, keeping Robin as the Good Guy. But instead of the whole “King John’s screwing up England until King Richard arrives, so Robin steals from the rich and gives to the poor” story that’s been told a bazillion times before, old Rids decided that he’s Lucas-ify the legend and give us a prequel of sorts: the story behind the story of Robin Hood. How Robin became Robin the legend. 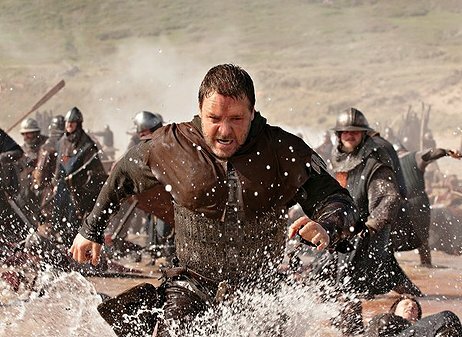 Ridey’s go-to guy for sword and sandal stuff, Russell Crowe, came on board to add the required acting gravitas to what was, effectively, Braveheart Revisited, as did fellow Aussie actress Galadriel. A slew of quality British and US acting talent also decided they wanted to sling arrows, and so Robin Hood came to the screen. No Robin, one does not simply walk into Mordor. Now, I’m quite sure ol’ Rid must have been having a quiet giggle to himself by casting two Australians as the leads in a film about a character so quintessentially British, a fact that would normally lead to plenty of jibes and ribbing in light of our long-time rivalry (The Ashes, Commonwealth Games, Kylie Minogue, hell – Danni Minogue) with the mother country. Both leads carry the film well, and both have perfected the English accent well enough to pass as the legendary figures they represent. Crowe maintains the gravely voiced demeanor he’s used in in just about every role he’s done since Gladiator, and for a bit it seems like a reprise of that Oscar winning film, just transplanted 1000 years into the future. Galadriel holds her own as the feisty, cheeky Lady Marian, whose father in law (Max Von Sydow) is elderly and infirm (but in fine mental health). Robin Longstride, an archer in King Richards army, is making its way home to England after a decade in the middle East on a Crusade. When Richard is killed during a siege, Robin is tasked by a dying Robin of Loxley to return the Kings crown to England, as well as his father’s sword to his elderly father. Robin assumes the name of Loxley, and returns to England as instructed. Both he and a group of men from Richards army end up at an estate in Nottingham, where Robin is asked to pose as Lady Marian’s late husband, in order for the estate to remain within the family and not become crown land. Meanwhile, the new King of England, John (brother of the late King Richard) has decided that he must put down a rebellion by northern Barons who are hostile to his taxation regime, as well as counteract a potential war with France. Godfrey, a henchman of King Johns, is actually allied with the French king Phillipe, who is about to invade England and seize power. Robin must take up arms to defend not only his adopted home of Nottingham from the evils of King John, but the country as well from the army of the French. Oh, and he must also woo Marian, if not for any other reason but to have a romantic interest. They call me MISTER Hood!!! 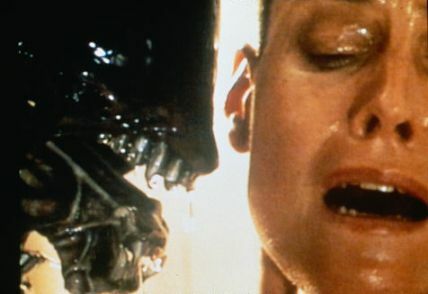 Part of me feels that Ridley Scott has been cruising for too long on his fame with Blade Runner and Alien, and that many of his recent films have felt a little same-y. The production design and visual aesthetic of Gladiator has been carried across into each of his successive films since then, and it’s beginning to feel a little old. The fanboy reverence with which many gasp and sigh as a new project is announced has started to dissipate, as Scott’s reliance on the jittery framed, blisteringly frenetic action pieces and razor sharp, muted colour palettes becomes his stock in trade. A lack of freshness has begun to creep into the directors work. That said, the design of Robin Hood is superb: a realism and grittiness in keeping with the tone and style of what Hollywood has come to define as the Middle Ages. The film is muted in colour, although not desaturated a la Saving Private Ryan, but lacking the stunning vibrancy 35mm can produce when required. While Robin Hood doesn’t try anything new, especially in light of the countless period films involving intrigue, subterfuge and hand-to-hand combat with swords, this version of the classic story does lean in favour of action and widescreen epic-ness to counteract a dearth of character development. The little back-story to Robin we’re given is lip-service only – we don’t know much about him save that he’s brave, has the loyalty of his men, and runs a shell game on the side. Marian, meanwhile, has a lot more development, due to her story being told concurrently with Robin’s even though they’re not in the same country. King John and Godfrey are the two antagonists of the film, and Ridley gives them both their due: they each get pretty close to equal screen time. Mark Strong, as Godfrey, is the superior actor, and quickly becoming typecast as the dark, brooding villain in many a mainstream film. William Hurt looks strangely lost as one of the Kings aides, his raspy delivery at odds with the pompous ceremonial tone his character employs. The majority of the rest of the cast, aside from the always-excellent Max Von Sydow, are pretty much window dressing, and Scott does little to avoid this: the script bubbles along with characters coming and going, fighting and merry-making, as fast and furiously as possible. The dull moments are over quickly, as the action picks up in the final act. With the film essentially paying brief homage to the more obscure quirks of the Robin Hood legend, the story doesn’t get in the way of a good time. Purists will denounce Scotts decision to give us a prequel film, a historical narrative on the “real” Robin Hood, but I think the way it’s filmed, the way the scripting avoids anything resembling actual emotional content except the most obvious, and with a focus on the main leads, Robin Hood is a film the word “rollicking” was invented for. It takes some liberties with historical fact, and probably feels a little hip to itself to be realistic in its content, contextually speaking, but when you’ve got Crowe swinging that sword and Galadriel donning a helmet and going gung ho like Eowyn in Return Of The King, this isn’t your standard Hood flick. Scott almost delights in the upstaging Crowe and Galadriel do to each other – a key scene with them in the boudoir upon Robin’s initial night as Marian’s “husband” is quite funny, if somewhat modern in it’s presentation. Mark Addy, as Friar Tuck, and Kevin Durand, as Little John (who gets the films best line!) are added comedic relief, which gives Robin himself more room to be the serious dramatic character Kevin Costner only wishes he’d have been. Terrence didn’t like The Backstreet Boys. Not one little bit. If I was to really nitpick this film, I’d say the subplot of young kids running about Sherwood Forest poaching animals feels a little off-centre, a little unnecessary. This plot device is never used properly by Scott, and could have been excised completely to tighten up the films substantial running time. No doubt the original theatrical cut would have trimmed this down. Apart from that, Robin Hood delivers an old-time spectacle adventure, with plenty of wide vista shots and intimate, firelight tomfoolery, as well as Scotts iconic jitter-frame battle sequences. Which brings me back to the “same-y” point I was getting at earlier. A film like Robin Hood, especially one with so little blood and gore being spilled (even though plenty should be spilled by rights) doesn’t need the added modern production trick of turning the film into Saving Private Ryan anytime a sword is pulled out. I understand that Ridley likes this kind of thing, and in context it can be quite cool when used properly, but with Robin Hood, it comes across as a little jarring here and there. 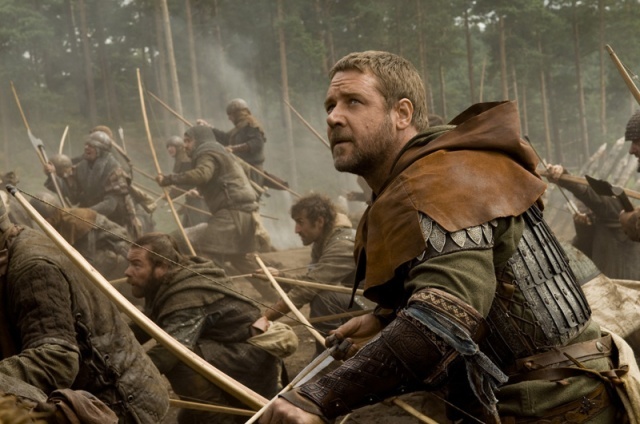 Understandably, Ridley didn’t want to turn Robin Hood into a bloodbath such that Mel Gibson would claim copyright, but the juxtaposition of visceral, violent action mixed with a decided lack of body parts and gore makes this Hood feel flimsy in the realism stakes. Remember the remarks I made about 10,000 BC, in which not a drop of scarlet liquid was seen anywhere, even if somebody had been spiked with a stake? Same goes for this film: blood effects are used most sparingly. Don’t get me wrong; I’m not trying to say that Ridley screwed up by not having a ten gallon drum of blood sitting just off frame and exploding anytime somebody got sliced with a sword, but I am saying that if you’re going to make a film realistic, or close to it, then you need to show the consequences of having a three foot blade of steel go through a mans body, not just pretend. You look stupid if you pretend. Is now a good time to use the word “gadzooks”??? I can understand why some people didn’t think Robin Hood was all that good: if you dig deeper than the surface the film isn’t very developed, which is unusual for Ridley, whose past films have given us plenty to work with. Here, though, he seems content to simply give us an adventure film in the style that made modern Hollywood great. Action, a few winks at the audience, some romance (albeit a little underwhelming in this instance) and some fun. If you expect more than simple entertainment, then you’ll be left clawing the wall and tearing off your fingernails with frustration. It’s as close to Michael Bay as Ridley Scott is probably likely to get – thankfully eschewing the formers epileptic editing and penchant for slo-motion in favour of a straightforward, unassuming epic in the vein of old style Hollywood. As a fellow Aussie, I like to think Errol Flynn would be proud. Every day I watch one, I’m so thankful that BluRay has become the format of choice for any serious film buff. The old days of DVD, with it’s 720i frame quality, have long gone, and it’s a real pleasure to watch modern films in full 1080p on BluRay. Robin Hood is yet another film that is astonishingly good on BluRay, at least in the technical sense. 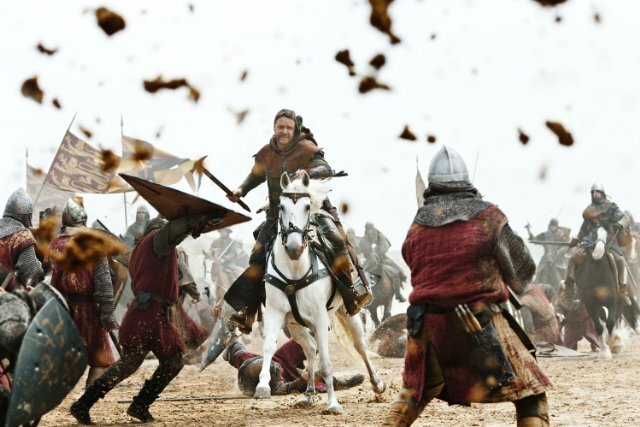 Ridley Scott is renowned for his technical demands on film, from the picture quality to the sound mix, and Robin Hood delivers a performance on par with Gladiator and Black Hawk Down. Visually, the film is beautiful. The BluRay allows every fleck of dirt, every pore of Russ’s face, and every glorious glance of Galadriel to be displayed wonderfully. Colours and black hues are spot on, with only one instance of crush that I noticed in the opening. The film runs just over two and a half hours, and the encode on this BluRay disc gives nothing away in quality. Loved it. 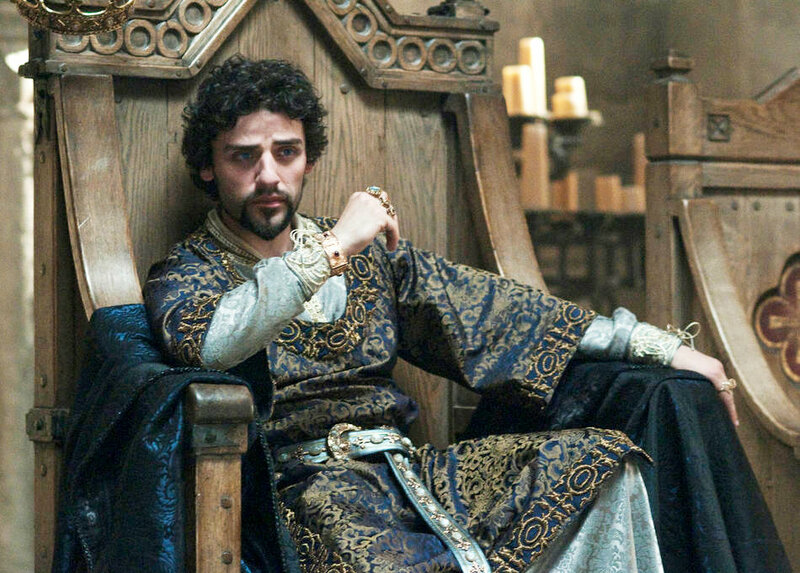 The audio on Robin Hood, as you’d expect on a Ridley picture, is nothing short of exemplary. An HD DTS mix is provided, with gorgeous use of the surround field to really envelop you and place you in the action. The vocals never become lost in the mix, and if you’ve never heard bass in a movie before, then this is the one to introduce it to you. Sonically, I cannot fault this film or this disc. Regardless of your thoughts on the film itself, watching it on Blu is a guilty pleasure. The image leaps off the screen in a detailed, almost 3D way, and the audio track is as good as I’ve ever heard on a film. Drunk and fell asleep in this one, i'm afraid, which explains why i didn't pound out a review. i heard Rob in the Hood wasn't so great, but your throughful review is making me think i should try to find it somewhere. Thanks, brother. I wouldn't say it's great, but good enough to warrant at least one look.